This patient was referred for evaluation of a macular hole in the left eye after a decrease in visual acuity over 6 weeks. In addition to the macular hole, an incidental yellow-orange plaque was visible within a vessel of the inferotemporal arcades within the inferotemporal macula. The patient had a history of recent cardiac surgery. The inner layers of the retina gain their blood supply from the central retinal artery, and in some cases, the fovea is supplied by the cilioretinal artery. Patients with an embolism may be asymptomatic, like this patient, when a peripheral arteriole is occluded. Common embolic sources are cholesterol (Hollenhorst plaque), platelet-fibrin, or calcific emboli, and all of these emboli are related to underlying vascular disease. Additional sources of emboli include fat, septic, and talc emboli. 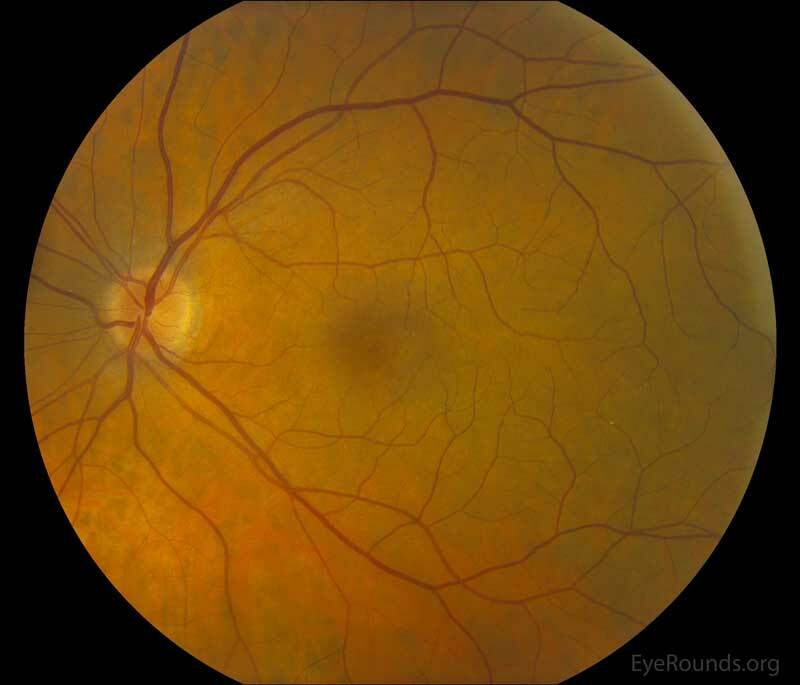 If these emboli lodge in larger vessels, a branch retinal artery occlusion (BRAO) or central retinal artery occlusion (CRAO) may occur. No known therapy has been effective in improving visual damage.